So remember me telling you about the mid century chair I scored on craigslist a few months back. We were lucky enough to find one in a pretty neutral fabric but it's obviously dated and we knew we wanted to eventually change it but didn't know what we wanted. Then a few weeks ago I was flipping through Viva Terra and came across these chairs and the light bulb went off. 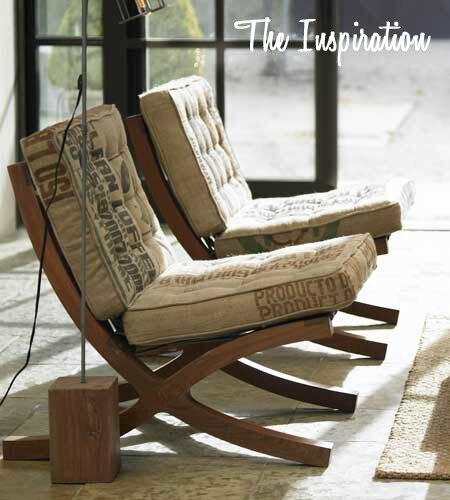 I am going to recover my chair in coffee sack fabric. The coffee sacks are so cheap and I love the look of it, it's different and unexpected which is always something I love in interior design. I can't wait to get started...I'm ordering the fabric today! That will look great! 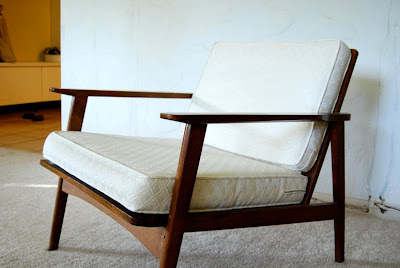 I rented a room in a house for a few years that had chairs like the one you found on craigslist... among lots of other mid-century items that were original to the house. It was a neat place. Sounds like it! That's one of my favorite things about that era are the chairs!! What a wonderful, fun and unexpected idea! I would love to know your fabric source if you're willing to share. I am searching for a similar look. Your chair is going to look so FAB! Stacy I am happy to share my source. I also e-mailed you with the information. I found a great source at onlinefabricstore.com. I have also found various bags on Etsy and read that you can get them from your local coffee shop. They will actually sell them to you for about $1 a bag. Hope all this helps!